Estefania Paredes, postdoc for Dr. Peter Mazur, has received a signal honor from the Royal Academy of Doctors of Spain and will be flying to Madrid this Wednesday to be presented the award. A small fraction of Spanish doctoral students are awarded Ph.Ds with “highest honors”, which makes them eligible to be nominated for an award from the Royal Academy. This past year, they received 209 nominations and made awards to thirteen, one of which was Estefania. 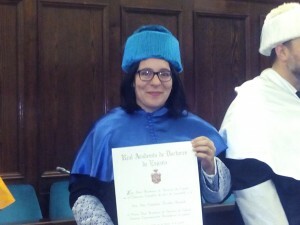 Below is a picture of Estafania in her Academic Doctoral Robe in Madrid. The picture is followed by a summary of the award and her thesis. The Royal academy of Doctors of Spain was born in 1915 with the purpose of protecting and enhancing the figure of PhDs and their contribution to the enhancement of the sciences and culture. Every year they grant 9 awards to the most outstanding PhDs work from all Universities in Spain and from all academic disciplines. These Year 200 doctoral theses were presented for those nine awards. The category of Experimental sciences and technology registered 42 candidates; the result was a tie between Dr. Jesús Esteban Serrano and Dr. Estefania Paredes Rosendo. The awardees will be honored in the Academic Opening of the Year at the Ministry of Education, Culture and Sports in Madrid on October 14th, 2015. Dr. Estefanía Paredes Rosendo’s PhD thesis was entitled “Cryopreservation of marine invertebrate early-life stages: applications in marine water quality assessment and aquaculture”. Few studies have focused on the cryopreservation of sea urchin cells; in fact the scarce research available has been published mostly on sperm, late embryos or larvae due to the impossibility of successfully cryopreserving oocytes or early embryos. In this thesis a cryopreservation protocol for sea urchin Paracentrotus lividus embryos was designed and standardized for first time yielding high survival, larval growth and acceptable larval settlement to juveniles, from an early‐life development stage. A cryopreservation protocol was also developed for trochophores of three bivalve species: mussels Perna canaliculus and Mytilus galloprovincialis and oyster Crassostrea gigas was developed yielding good survival (Over 50%). On a more applied point of view, a detailed study was carried out about the applications of cryopreserved larvae from those species in aquaculture. And a cryopreserved embryo bioassay for marine quality assessment was also developed using cryopreserved embryos instead of fresh embryos (standard test) as a tool that could enhance the use of these biological tests through enabling the conservation and storage of biological material for out of season research. This Ph. D. work received the University of Vigo’s extraordinary award for outstanding Ph. D. year 2014.